Because It’s Really Their First Car | "In good writing, WORDS BECOME ONE with things." ← Happy 5th Birthday, WBO! There were a ton (okay, two tons) of items acquired to prepare for the babies, but none that I anticipated more than the purchase of our stroller. I am a member of an unusual species, one that looks at strollers like cars, and did so long before my own children entered the picture. 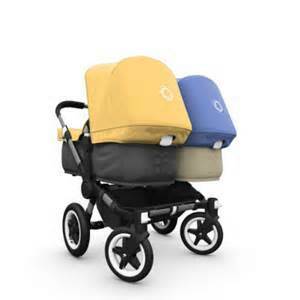 I can’t really explain it, because I had no interest in any other baby paraphernalia, but before I had the babies I could pass six strollers on the street and tell you the make and model of each one, along with which was used by a celebrity for their spawn. File under: useless information recall. Six wheels? The thing is about eight feet long. How do you turn? Or fold it up? Forget about it. 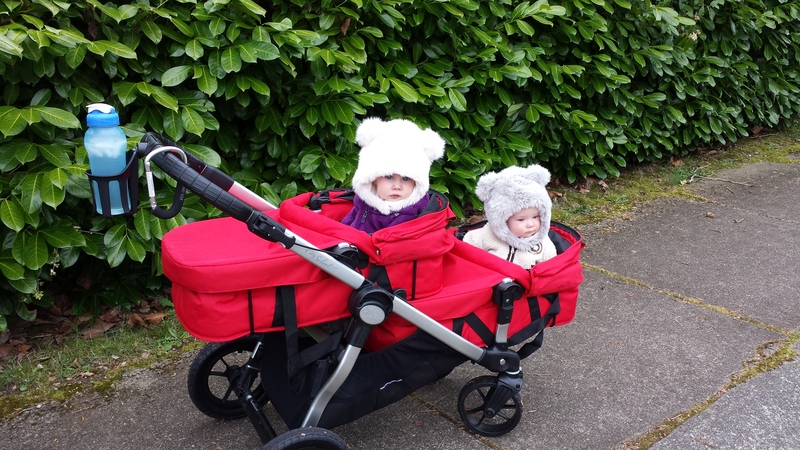 Next I thought I wanted the Bugaboo Donkey Twin stroller, but I test drove one and it felt forty feet wide and I knew it wouldn’t fit through standard door frames, no matter what they told me. Fitting through doors, I’d say, is kind of essential. 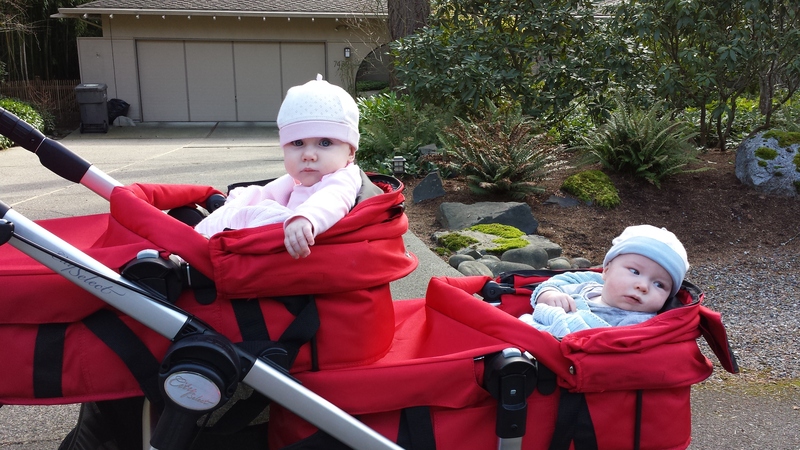 Easily the most popular stroller in Seattle is the BOB, and it’s popular for good reason. I just couldn’t go with it because it didn’t fit two car seats, and it was beastly to collapse and store in the back of the car. Where to turn? What to do? 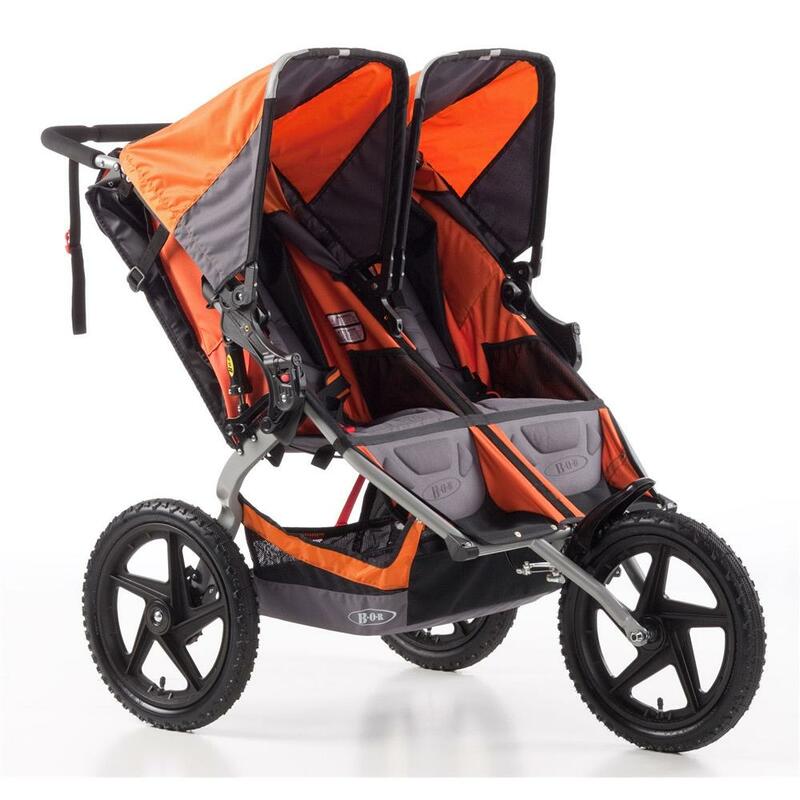 After an embarrassing number of hours of research, a fellow twin mom told me she was going with the Baby Jogger City Select, which I had never heard of. At first I naturally thought, “amateur” but after further intense research, I dragged Mike to the store and we fell in love with it. I also asked for stroller recommendations at the next EMOMs meeting, and was met with a chorus of advice to get the City Select. 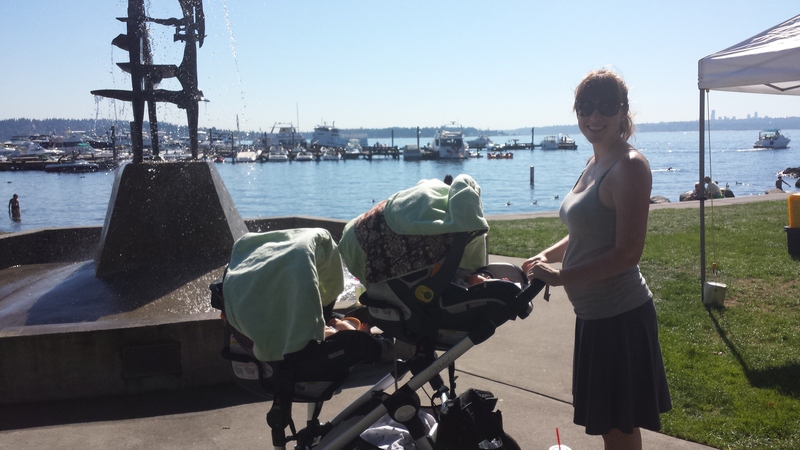 I insisted on adding the bassinets, because one of my long-held stroller fantasies was to push a baby in a bassinet. It’s so classic, so British, so splendidly posh. If I was going to be falling asleep at the wheel, I was going to do so behind a bassinet. Or two, as the case may be. After ten months with our little red SUV, I can now report that it was a wise purchase. 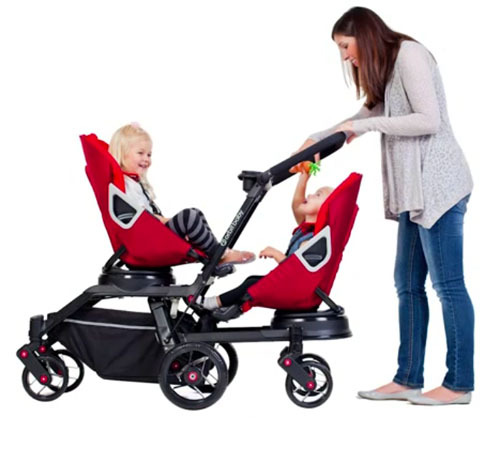 Speaking of purchase, I haven’t listed the prices of any of the strollers here intentionally; those who care will look it up, and those who don’t I won’t horrify. Just remember: Judgy Wudgy Was a Bear. What makes the City Select so choice, as Ferris Bueller would say? The versatility. It can be configured to hold two bassinets, two car seats, two seats, or some combination of those if you have children of different ages. We can even add a glider board once we have another baby so all three are riding (which sounds ridiculous, but we’ll see when we get there). This only required one bassinet, obviously, and it worked well. During subsequent outings I would choose bassinets or car seats based on whether they were sleeping, or likely to. It sounds complicated to configure, but the bassinets just click in and out, and then we click little frames in to hold the car seats. As the babies were able to sit up, I would let them ride perched in the bassinets. 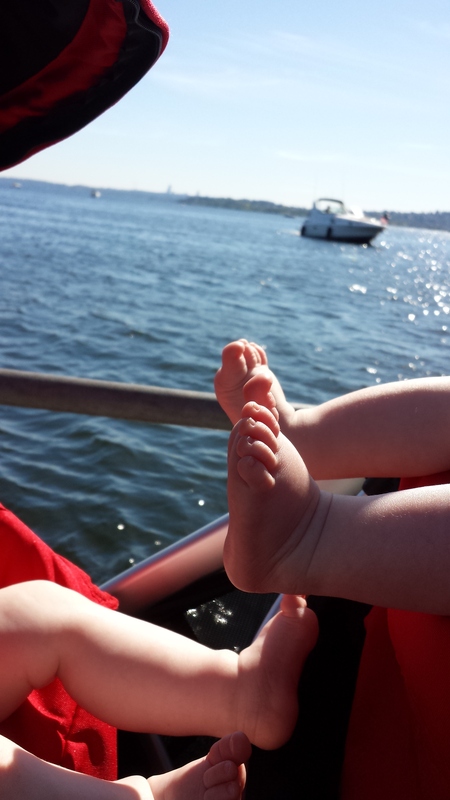 This was adorable, but unsafe, as they could arch their backs and fall out (theoretically…it didn’t actually happen). It took me a very long time to switch to the big kid seats because I was so attached to the bassinets. 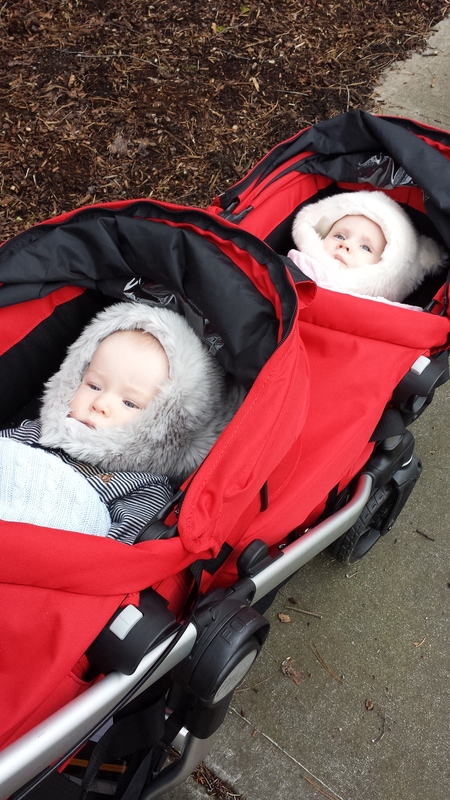 Also it was winter, so it made sense to keep them in their little traveling sleeping bags. But a couple of weeks after they turned eight months in late March, it was time to make the switch. We ran into our friend Matt soon after, and he summed it up perfectly: “First stop: five-point harness, second stop: college.” This was EXACTLY why I didn’t want to move out of the bassinets. It was like admitting they were ready to have email addresses. We can have the seats face front, back, or each other. We always have them facing each other because then neither of them is staring at the back of a seat. Plus they interact, which is just as adorable as it sounds. On rare occasions one of them will fall asleep in the car and one will still be awake, in which case we rock the different seating combo. 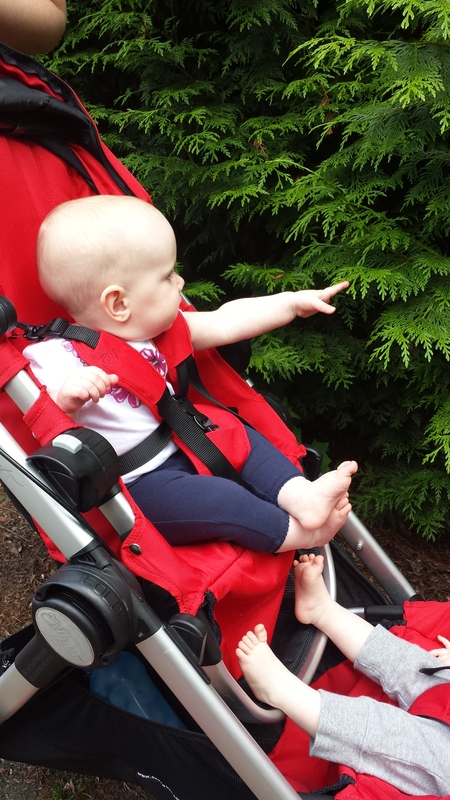 One of the key requirements in our stroller search was that it be easily collapsible, as I’d be doing it myself the majority of the time. The City Select has two knobs on either side and when I pull them at the same time they collapse the whole thing. 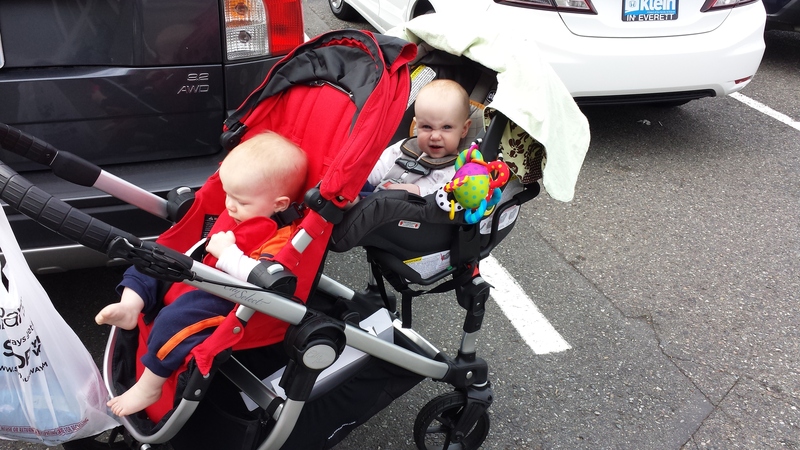 It’s really easy, but it’s still a little awkward to load into the car since it’s not a featherweight umbrella stroller. The name makes this obvious, but we use it to go on runs and it does just fine. 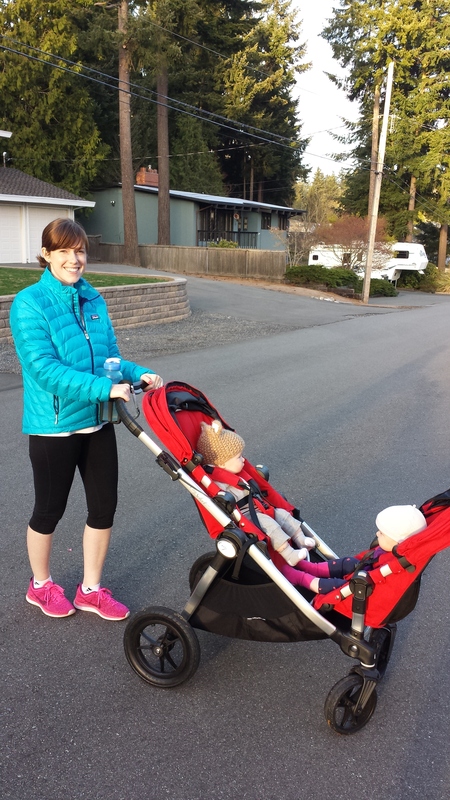 At this point Baby Jogger should be sending me a check, but since they’re not, I’ll conclude with its drawbacks. 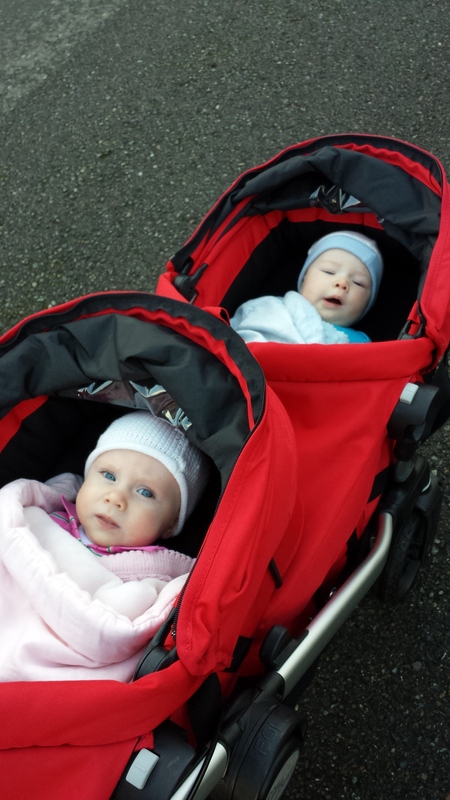 There isn’t a safety connection from my wrist to the stroller, which I think of every time we go running, as I imagine myself tripping and sending the twins into oncoming traffic. 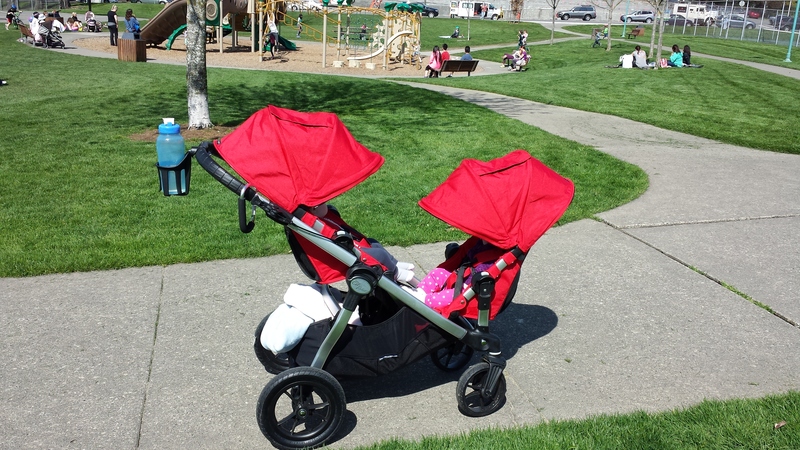 It’s not “recommended” for jogging like their sportier strollers are, so I’m sure there’s a better running experience out there, but the ride is smooth and works for us. I’m hoping to do a post soon about other top products I haven’t been able to live without, but for now I had to start with the mothership. I’m reminded of it everywhere we go, because sometimes it gets more attention than the twins do. 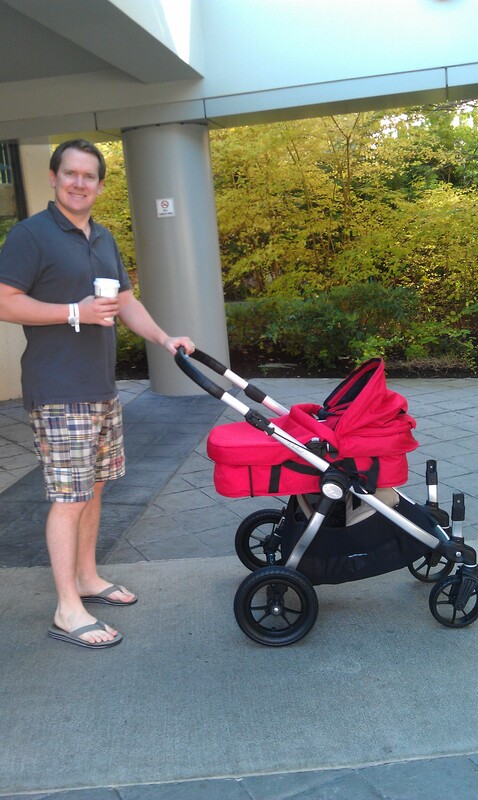 I don’t like to say I love inanimate objects, so let’s just say that I deeply like this stroller.